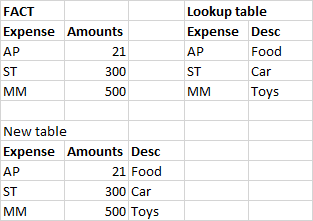 Table 1 is a fact table with many row of data Expense items, and amounts. I want to create new table from the fact table and grab the description from the vlookup table. I can not find a way to select the description from the vlookup table, relation ship exists between both. Do you mean to create a table in DAX using SUMMARIZE, check the videos on tables and virtual tables. merge tables (as new) in the query editor, effectivyle a vlookup in Power Query. Both will work. Thank you, I always prefer to use DAX functions. Thanks for your quick support. Ok, my pleasure. In that case I suggest you watch the relevant videos that Sam has concerning creating tables with DAX. Look for SUMMARIZE and ADDCOLUMNS functions in this respect. Bear in mind, depending on the size of your model and nature of your data, the model may well be faster using Power Query for this instead of DAX. I prefer to use PQ whereever I can.